1. The Last Jedi resonates or “rhymes” with other Star Wars films without slavish predictability. The Force Awakens recalled, with great nostalgia at times, many qualities, characters and plot points from A New Hope. But some fans were disappointed in these “recycled” elements, particularly the overarching goal to blow up yet another bad-guy superweapon: the Death Star, the Death Star 2.0, Starkiller Base… Whatever they chose to call it this time, the situation was the same: it’s big, it’s threatening the entire galaxy, and the characters need to work together to blow it up. As we might expect, The Last Jedi echoes and resonates themes found in The Empire Strikes Back, especially as the main character Rey confronts her own connection to the Dark Side of the Force, signified most obviously in the character of Kylo Ren. This is a subtler, darker and yet perhaps more universally relevant theme than that which drove both A New Hope and The Force Awakens. Hence in The Last Jedi we have a darker film than The Force Awakens, and mirroring the critical acclaim of Empire, one I suspect fans will enjoy even more. I’ll hope to get into the specific (and spoilerific) elements of The Last Jedi which mirror and interpret Empire in another post after Christmas, but for now I recommend watching the new film with Empire – and especially but not only Dagobah – in mind. 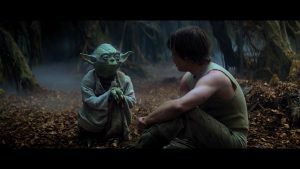 Then you must unlearn what you have learned, because The Last Jedi takes Empire’s themes (as well as themes, images and symbolism from other Star Wars films) in some new and unexpected directions. 2. Despite its dark aesthetic, The Last Jedi is a very funny film. The Internet is alight with Porg references, and for good reason. These furry, wide-eyed, pathos-inducing, penguin-thingies, which inhabit Luke’s island of Ahch-To and infest the Millennium Falcon, are the most loveable creatures to come out of Star Wars since Ewoks. Beyond Porg humor, other characters and situations add comedic moments that keep The Last Jedi from languishing in its darker moments. Poe’s taunting of General Hux (someone needs to taunt that horrible man!) in the opening scenes was a personal favorite, but Finn, Chewie, and new characters Rose and DJ serve up great comedic moments as well. 3. The Last Jedi fully embraces, amplifies and advances what is Tolkienian about Star Wars. In George Lucas’ third draft of the film that would become A New Hope, the influence of Tolkien’s work is all too clear. Really, really, way too clear. Like, plagiarized. The first encounter between old Ben Kenobi and the young Luke Skywalker is lifted straight out of the “Good morning” scene between Bilbo and Gandalf in The Hobbit. Though this scene changes in the final version (! ), we can still recognize and appreciate how Tolkien’s work illuminated the way for Lucas in the finished version of Star Wars, with its wise old wizards, made-up languages, a Supreme Object of Evil that must be destroyed, machine-like soldiers, and dark deputies who ruthlessly implement the Uber-Baddy’s plans. It’s no secret that Star Wars Rebels (the animated TV show on Disney XD) has, through creator Dave Filoni’s imaginative genius, been heavily influenced by Tolkienian storytelling. One element that Rebels fans may recognize from Tolkien is the unexpected role of mystical animals in the fates of the main characters. In The Hobbit, everything from giant eagles, a very intimidating were-bear, even a chatty old thrush assist Bilbo and friends. In Tolkien’s anti-industrial worldview, these animals represent the untold, unexpected power of nature and Tolkien’s own bias toward the creations of God over the creations of humans. “Follow the white Loth-cat!” has become a mantra in Star Wars Rebels, for doing so always seems to lead Ezra, Kanan and the other good guys out of a pinch. It suffices to say we see at least one really wonderful example of this “follow the wisdom of the animals to safety” plot device in The Last Jedi. The Last Jedi also continues the related Tolkienian theme of true, lasting power residing in the small, the weak, the insignificant. Poe’s X-wing mission in the film’s opening is an illustration of this, but the theme grows throughout the film until Poe himself sums it up in a wonderful line that expresses the remnant Rebellion’s role in the fight against the First Order. (It’s been spoiled in trailers, but skip to the next paragraph if you’d rather hear it from Poe first.) “We are the spark that will light the fire that will burn the First Order down.” The film’s curious closing leaves audiences with a strong sense of hope that, in the most unlikely of places, the spark of the Rebellion will indeed continue to grow. That’s all I’ll say for now. I hope you enjoy the film as much as I did. 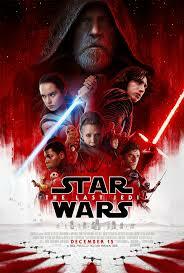 In January, I’ll participate with some of my fellow Star Wars wonks from the Mythgard Institute in a Mythgard Movie Club discussion of The Last Jedi. I hope you’ll join us; it’s free and promises to be both interactive and lively. For now, please share your (spoiler-free) thoughts about Star Wars: The Last Jedi in the comments below. And as always, for more of my Star Wars musings, I invite you to follow me on Facebook and Twitter (@ekcstrand). See Chris Taylor, How Star Wars Conquered the Universe (New York: Basic Books, 2014), 123. It was very good and I look forward to your coming analysis! The surprise I was expecting didn’t occur. I really like the one that occurred. Star Wars……Tolkien……Harry Potter…..Hunger Games…..all rolled into one movie !! ?? I’d add two things. First, I think there are a lot of references to _Return_ as well. It references both movies quite a bit. Second, _The Last Jedi_ reverses or overturns the elements and scenes referenced from the original trilogy. I am thinking of the stuff with Snoke but won’t say more to avoid spoilers. John – I thought the same thing about Last/Return – ironic reversals in the new Star Wars sequel trilogy seem to be a thing so far. The Force Awakens definitely did not get enough credit for how it – as you say – overturns or reverses elements or themes that it echoes from the original film. People just decried it as copying when there was really much more going on. Thanks for sharing your thoughts. Emily Strand is spot on with her take on the Tolkienian elements that are in the new Star Wars, ‘The Last Jedi’. Warning: I may hit some spoilers here so if you haven’t seen the movie, scroll off of my post!! The “suffering hero” (Frodo) aspect is quite evident in these last two films. We see Rey making many internal and external revelations about her role and calling within “the Force” and carrying that burden through the battles with Kylo Ren. A Harry Potter/LOTR connection is the torture and struggle between them in their inner most thoughts…almost a “soul” connection. Sound familiar? Frodo and his connection to Sauron through the One Ring…..Harry Potter and the Dark Lord Voldemort as a couple of examples. Oh and as an aside…Kylo Ren (Adam Driver), if J. K. Rowling is going to be seeking a younger “Severus Snape” in his late 20’s for the Fantastic Beasts movies, Jo there’s your actor for that role !! We have a scene where Rey walks into the Jedi Cave while she is an understudy with Luke Skywalker….She walks up to the Crystal Wall and touches it and asks. “Show me my parents”, another Harry Potter connection…Harry walks up to the “Mirror of Erised” in “Sorcerers Stone” and gets to see his deepest Desire…his parents!! The similarity of the First Order and its Authoritarian/Totalitarian rule through Supreme Leader (Snoke) and the same rule in the Hunger Games with President (Snow) in Panem is striking. Both seek to rule over their respective universes with an Iron Boot. Then you also have the scene of Casino at Canto Bight, the buildings, the opulence, the dress of the characters to the hair styles are strikingly right out of the high class event gatherings of the citizens of the “Capitol” of the Hunger Games. Now we have a favorite part for me, the magical (otherworldly) Creatures in this Star Wars. 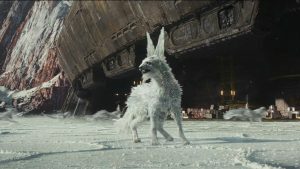 The Porgs and especially the Crystal Foxes (Vulptex) who play a pivotal role in this movie could have easily slipped out of Newt Scamander’s carrying case in Fantastic Beasts. Multiple genres come out the Star Wars saga that just enhance the way to enjoy Great Stories that compliment each other.